Holiday Gifts for 2016 and voice command device from Amazon.com responds to the name "Alexa" and can stream music or anything you want to play via Bluetooth. Tell Alexa to play your favorite radio station and she’ll tune in. It will play you audiobooks, host trivia night, set a hands-free timer, order delivery and communicate with many of your smart Internet of Things (IOT) devices around your home. Amazon Echo Dot. Basically this is Alexa without the speaker. If you have a compatible wireless speaker at home already, you can purchase Echo Dot for less than half the price of the Amazon Echo. Nest Learning Thermostat. The Nest Learning Thermostat automatically adapts as your life and the seasons change. Just use it for a week and it programs itself. Nest shows you how much energy you use every day in your Home Report. You can see when you use more energy, like on weekends or Monday nights, and how to use less. The 3rd gen Nest Learning Thermostat has new rings and a big, sharp display. The most beautiful part is that it saves energy. Fitbit Charge 2. Fitbit released four new wearables in 2016, the best of which is Charge 2. The Charge 2 offers up more than just step counting, sleep tracking, and other basic functions. It’s not quite along the lines of a full-on smartwatch or the Fitbit Blaze, but it’s a terrific middle ground unit. Apple Watch Series 2. In addition to all of the features that come with the standard Apple Watch – health and fitness tracking, apps and notifications, ask Siri, and customizable watch face – the new Apple Watch Series 2 includes built-in GPS, a fast dual-core processor, and is water resistant to 50 meters. Bose Quiet Comfort 35 Wireless Headphones. These world-class headphones made by Bose leverage noise cancellation technology that makes quiet sound quieter and music sound better. The latest version includes the wireless convenience of Bluetooth and NFC pairing aided by voice prompts. The headphones have a strong, 20-hour battery life per charge or 40 hours in wired mode. These headphones also come with noise-rejecting, dual-microphone system for clear calls even in windy environments. SONOS. Sonos speakers fill your entire home with music. Use one app to stream different music in different rooms. Or send one song all through the house. Nintendo NES Classic Edition. If you can get your hands on one of these, gaming enthusiasts will be thrilled! The NES Classic Edition is an updated variation of the 1985 Nintendo Entertainment System and is a hot commodity this holiday season. The new console comes with 30 retro games – including “Donkey Kong,” “Final Fantasy,” and some “Mario” titles – already installed. The games themselves feature pixelated images that are sharper and brighter than the original versions. PlayStation VR. Virtual reality is the next big thing in gaming and until recently was previously limited to expensive PCs. The Sony VR for PlayStation 4 has received high praise for its quality and seems to already be dominating the VR market. This experience will completely immerse you in a video game by producing two images simultaneously and then sending them to a headset a few feet away. But unlike the competition who require expensive graphics cards to get the job done, PS VR can do it using only the PlayStation 4's built-in GPU. While it can only be used on PS4, it also requires some additional hardware, so your best bet is to go with the VR Launch Bundle for an additional $100. Bluesmart Suitcase Black Edition. For your friends who travel frequently this tech-equipped suitcase is a no brainer. It’s basically a personal travel assistant – it charges your devices, has a digital scale to check the weight of your bag, remote lock and an international bag tracker. If you’re looking to keep spending down, Bluesmart has a less-expensive option equipped with the same core technology. 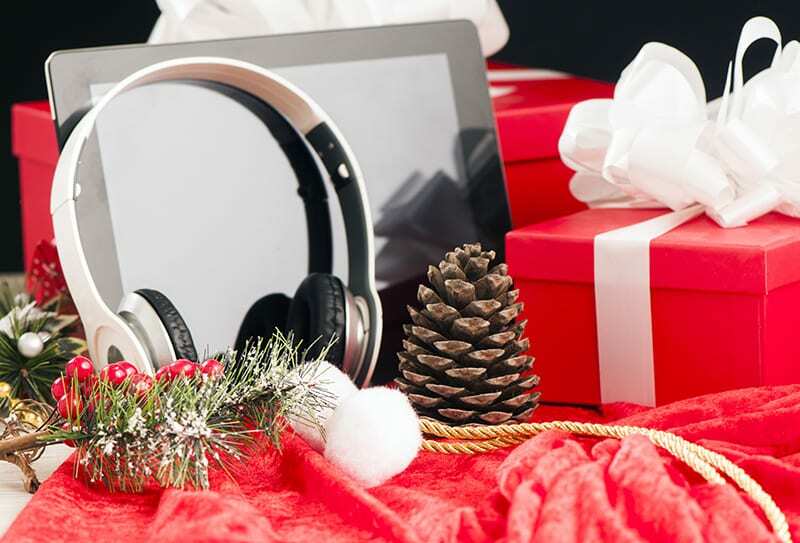 Bonus: Here are a few smaller, less expensive gift ideas that would make great stocker stuffers for your family members and friends: FINsix's Dart, Griffin Itrip Clip, Duet Display. Amazon Echo. This wireless, smart speaker and voice command device from Amazon.com responds to the name "Alexa" and can stream music or anything you want to play via Bluetooth. Tell Alexa to play your favorite radio station and she’ll tune in. It will play you audiobooks, host trivia night, set a hands-free timer, order delivery and communicate with many of your smart Internet of Things (IOT) devices around your home.